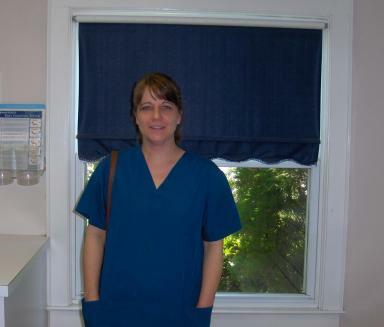 Our veterinarian, Dr, Kelly Goodson Hallman, is a native of West Columbia and graduate of Brookland-Cayce High School. Following high school, Dr. Hallman attended the University of SC for undergraduate studies and the University of Georgia, College of Veterinary Medicine for Veterinary School. After working at a large clinic in Rock Hill, SC for several years, Dr. Hallman moved home to West Columbia to open her own clinic, West Columbia Animal Clinic, in 1994 in a leased location on Sunset Blvd. As the practice grew, Dr. Hallman chose to move the clinic to its current location in the Springdale community of West Columbia in 2000. The main part of the office is located in a charming, 1940's style home converted into a reception area, exam rooms, and pharmacy. Attached to the "house" is a modern veterinary clinic including a treatment and dental room, a surgery suite, x-ray room, isolation area for contagious cases, and separate kennel and hospital areas for dogs and cats. The back of the clinic is a large fenced, grassy yard for exercising dogs. Margaret Holcombe, receptionist since 2006.